EDINBURGH, Scotland, 2016-Dec-01 — /Travel PR News/ — A Highland tour company whose offering includes a 12-hour Isle of Skye Tour to top sights such as The Old Man of Storr, the Quiraing and the Faerie Glen has achieved the highest Quality Assurance (QA) grading from VisitScotland. Award-winning company WOW Scotland Tours Ltd has attained a 5* Tour QA award from the national tourism organisation for its day tours. Departing from Inverness, the company’s flagship product, its Isle of Skye Day Tour takes visitors aboard a 34-seater coach and visits nine top attractions including Kilt Rock, Duntulm Castle and Eilean Donan Castle. Whilst they take in the stunning scenery and wild landscapes of Skye, a local tour guide provides an informative and entertaining commentary about the area’s history, myths and legends. This tour operates up to five times per week in the busy summer season. The tasty lunches and dinners which visitors can enjoy on the Isle of Skye Tour, are made to order each day by The Little Cake Shop in Portree using a variety of fresh ingredients, many of which are sourced locally. For example, the salad and fruit comes from the Soiltote Nursery on Skye, or from a farm in Forres. The eggs are from free range chickens which live on Skye, and all the cakes are homemade. WOW Scotland is an Inverness-based company run by husband and wife team Gordon and Kay Pearson. Since its inception in 2010, the company has consistently rated as one of the top tour operators in Scotland on TripAdvisor and in 2016 the company showcased the Highlands and Speyside to over 4,500 customers from all over the world. With a great passion and enthusiasm for the Highlands, the WOW Scotland team aims to provide every customer with a world-class tourism experience. WOW Scotland also offers two other scheduled day tours from Inverness – a Whisky Bus and a Highland & Speyside Explorer Tour, as well as shore excursions from the Port of Invergordon. 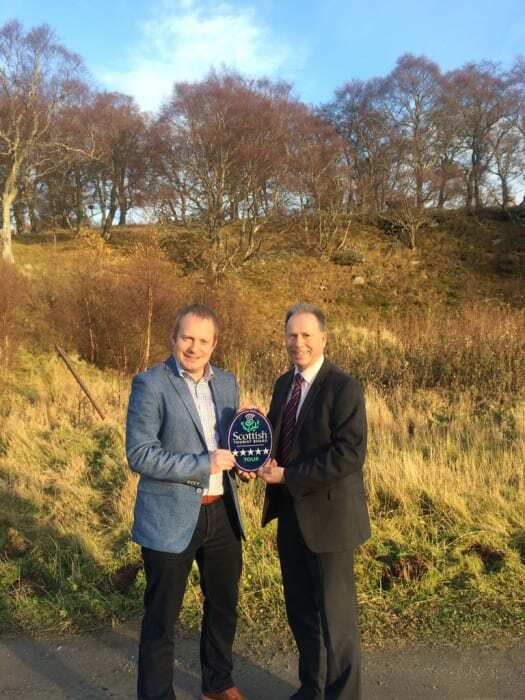 “As WOW Scotland aim to provide a world-class tour experience to all of our customers, we are delighted to have been awarded a VisitScotland Five Star tour grading, which categorises our tours as exceptional. “I would like to offer my congratulations to everyone at WOW Scotland Tours for attaining this award. It is fantastic to see the Skye tourism offering enhanced by such high-quality coach tours. “Reaching such a high standard is vital to the tourism industry as a whole and I hope it inspires others to strive for such results. It is vital that everyone involved in tourism works together to offer visitors a fantastic experience when visiting and staying in the Highlands. This entry was posted in Business, Tour Operators, Tourism, Travel, Travel Awards, Travel Management, Travel Marketing, Travel Services, Travelers and tagged Gordon Pearson, Highland tour company, Kay Pearson, Quality Assurance (QA) grading, Scott Armstrong, VisitScotland, WOW Scotland Tours. Bookmark the permalink.